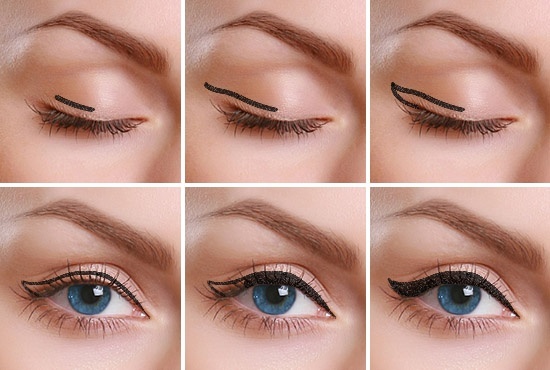 Applying liner is a basic makeup code that everyone may not crack easily. Whether liquid, pencil or in gel form, applying eyeliner can sometimes be rather tricky. Knowing how to apply the eyeliner is one of the basics of makeup, so if you love makeup, you eventually learn how to do it. Whether we are in a rush, are crippled with an unsteady hand, or never have been comfortable with liquid liner – eyeliner woes are pretty real. Here are tips and tricks on how to apply liquid eyeliner so your shaky hands won’t stand a chance and you’ll be lining your eyes like a pro in no time at all! Another basic but extremely important tip for applying liquid eyeliner is to apply a primer on your eyelids first before adding any color. 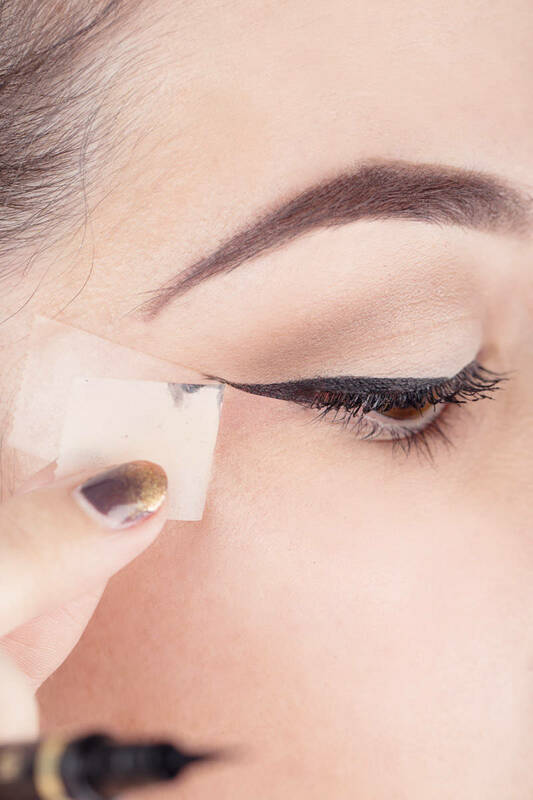 Including this step as part of your beauty routine will keep your eyeliner looking fresh all day long and prevent any potential flaking or smudging. We’ve all been there girls and once you’ve experienced the embarrassment of having eyeliner on one eye and not on the other at the end of the day you’ll know the true meaning of the eyeliner tragedy. The primer will also help with setting any eye shadow you may decide to put on before your liner. Beat uncertainty by starting with a regular pencil liner first before applying the liquid. As amazing as liquid liner looks once you’ve applied, it’s also a lot less forgiving when it comes to fixes or taking it off if you make a mistake. Using a pencil liner underneath the liquid also provides a good base for applying, will make your liner look more vibrant, allow you to create the desired length and thickness, and let you make any changes easily before moving onto your liquid. And, as if that weren’t enough, another benefit to lining with a pencil first is your liner will set better and be more likely to stay on throughout the day without needing any touch-ups. Make sure the pencil liner is freshly sharpened and depending on where you wish your eyeliner to begin, rest the pencil along the base of your lashes and move across the eyelid. There shouldn’t be any space between the liner and the lashes. 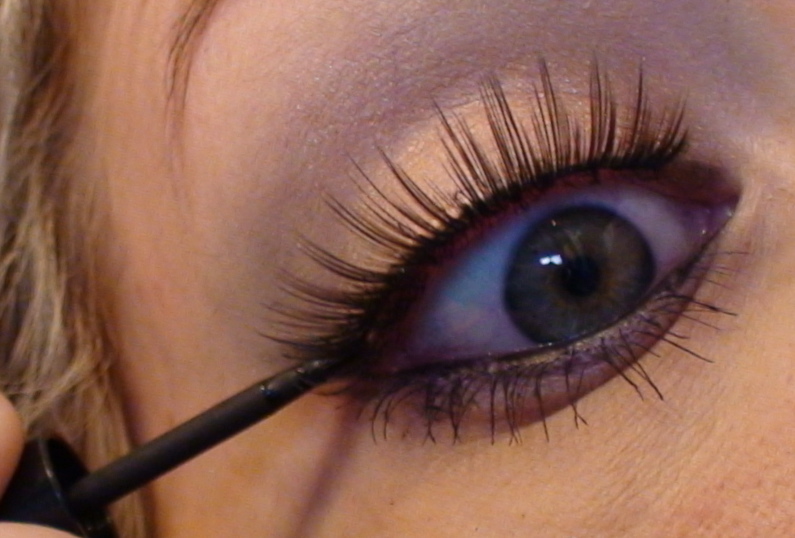 Create the thickness and length, clean up any mistakes using a Q-tip dipped in makeup remover and move onto your liquid. The secret to this is not to go across the eyelid in one fell swoop. Instead, use the ‘connect the dots’ method and make short little lines where you want the liner to go. Then, go back over the lines and fill in the gaps by starting at the inside or center of the eyelid (the easiest part) and moving out towards the outer corners. 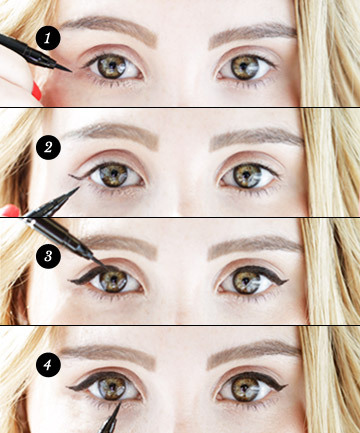 By doing this, it takes the pressure off of having to create the perfect liner look all in one stroke and allows you more control and time to make the line as perfect looking as possible. Make sure you use small lines and strokes. It’s always better to build it up. If you make it too thick, you might create a mess out of it, so keep the strokes small. Once you are satisfied with one eye, do the same with the other one. Try to keep it as symmetrical as possible. 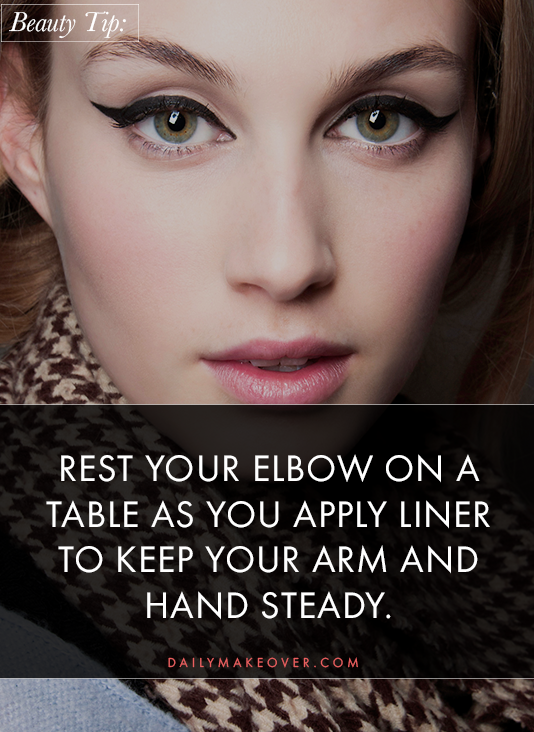 If you are new to the art of eyeliner, make sure you have a place to rest your elbow when you line your eyes. This makes it easier to apply and provides you with a steady hand, which will give you a clean and precise finish. If you have a vanity or a table, it’s best to do your makeup on that. Cosmetic mirrors usually come double sided, where one side is a normal mirror and the other side is magnified. The magnified one helps you achieve a cleaner finish as you can get a closer look. It is worth the investment. For those of us who seek a perfectly lined eye, here’s a tip on how to fix any little mistakes you may have made with the liquid liner: Dip a Q-tip into some eye makeup remover or eye cream and go over any spots that are uneven or too thick. 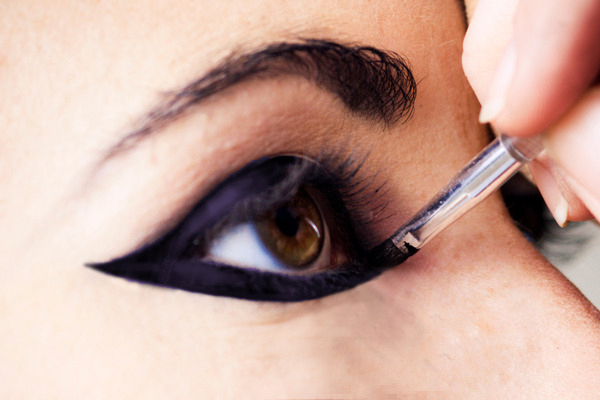 This is also a great trick for fixing a cat eye look that has gotten away from you. 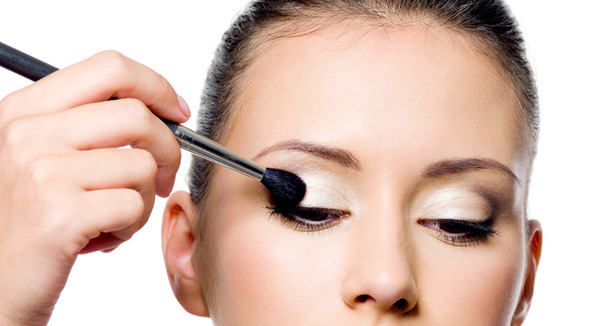 Once you have it looking good you can trace around your cat eye shape or liner with a concealer and set your eye makeup using a blender brush and some translucent powder.